GOLDEN AGE 1940 Superman "Man of Steel" Statue from Hallmark. A beautiful hand-crafted limited edition collectors' statue of Superman the way he looked when he was first created...big, broad-chested, the little squiggle of dark hair across his forehead...just downright super!! 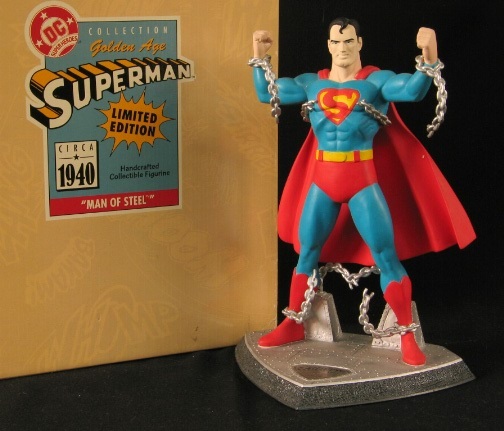 Superman is depicted breaking chains that were meant to restrain the "Man of Steel" by some super-villain or maybe even a Nazi, as Superman was instrumental in our winning WWII. This statue was part of a very limited edition set done by Hallmark over 15 years ago and is long out of production. This particular "Man of Steel" is number 10,773 out of 14,500. Superman "Man of Steel" is in his original box with the original styrofoam around the figurine undisturbed. The figurine has NEVER been taken out of the box and is in excellent condition. MINT, UNPLAYED, UNDISPLAYED...ABSOLUTELY PERFECT!! On the back of the box it reads: "From the time he made his first appearance in DC's Action Comics #1 (June 1938), Superman has become an American legend. Through the years, his character has set the standards for super characters everywhere. Inspired by one of the early comic book covers featuring Superman, this limited edition figurine celebrates the early years of the original Super Hero. Hallmark is proud to present the DC Super Heroes Collection depicting super heroes through the years." Only one of these beauties in stock...make it YOURS! !